Karen Karlitz was born and raised in New York City. As a young child she loved reading, and soon began to enjoy writing. She also developed a wanderlust, which led her to experience living in San Diego, Los Angeles, Marina del Rey, South Florida, Montreal, Oahu, Virginia Beach, and finally in Santa Monica, where she claims she will remain though her friends aren't so certain. After writing several screenplays while in Los Angeles, she wrote "Baggage," an e-book available on Amazon Kindle (http://www.amazon.com/dp/B00OMEN84A). "No Thanks," an excerpt from "Baggage," won the Jerry Jazz Musician New Short Fiction award, and another chapter from this book, "Pursuing Happiness," was adapted for a theater performance in Syracuse, New York. 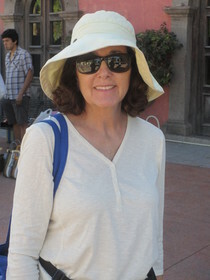 Karen has also written numerous fiction and nonfiction works which appeared in many publications, including the Los Angeles Times, Miami Herald, Toasted Cheese Literary Journal, Broad River Review, Loch Raven Review, Iguana Review, Ranfurly Review (Scotland), Short Fiction Break, American Diversity Report, Scribblers on the Roof, Miranda Literary Journal, Boomer Cafe, Long Story Short, Clever Magazine, Twisted Endings Magazine, and The Stray Branch. My work is character-driven, so it is the characters who inspire me to write. When I come across a character who interests me (imagined, real or a combination of both), it gives me the courage I need to sit in front of a blank screen and discover what he/she is going to do. Thank you so much, Karen, for your generous comment re my piece, Central Washington State On Five Dollars A Day. Welcome to Fictionaut, Karen! Enjoy! You must log in to write on Karen Karlitz's wall.